This interview was made by Marie Czernin for the German Catholic monthly magazine PUR. It was published in December 2004. (PUR - Politik und Religion, a very successful and independent magazine led by two journalists, Bernhard and Martin Muller - twin brothers aged 43). This monthly is Catholic and is distributed to all the Bishops in Germany. Bernhard and Martin Muller are deeply devoted to Fatima, where, in fact, the idea for this magazine was born. "As redactors, we had some doubts about making this interview, because the whole question around Medjugorje is a bit controversial. We have nevertheless decided to make it, because we want our readers to be aware of things that are spoken about in the world, and in this concrete case, in Germany. We are convinced that words spoken by Bishop Hnilica, transmitted integrally, will be interesting to our readers. These words speak for themselves. This article is not "a voice in favour of Medjugorje" raised by our magazine. On the contrary, it represents a decision to give to our readers concrete information about what people, including the Pope, are saying, or witness that somebody told, about the apparitions of Medjugorje and their fruits. This article follows two other articles about Medjugorje published in October, in the magazine of the Italian Bishops Conference "Avvenire", which speak in a positive way about Medjugorje. One of them reports that the Italian UN forces based in Sarajevo went on pilgrimage to Medjugorje in order to thank the Queen of Peace for her protection during their peace mission in Bosnia. The other article, published on October 10, 2004, by Allessandro Fo, professor of Latin Literature at the University of Sienna, speaks about his conversion as a fruit of his pilgrimage to Medjugorje. The fact that the magazine of the Italian Bishops Conference gives much space to the events of Medjugorje is interesting for us. 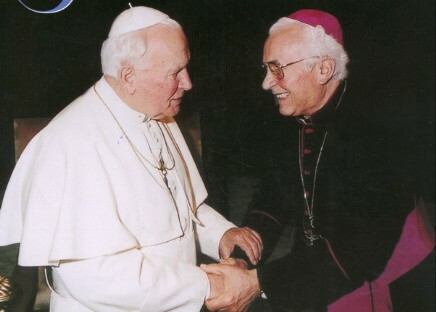 Marie Czernin: Bishop Hnilica, you spent much time with the Pope John Paul II and you had many private encounters with him - for example when you visited him at the Gemelli Hospital shortly after the attempt on his life, May 13, 1981. Did you ever speak with the Pope about the events in Medjugorje? Bishop Pavel Hnilica (B.P.H.) - I visited the Holy Father on 1984. We had lunch at Castel Gandolfo, his summer residence, and I told him about the Consecration of Russia to the Immaculate Heart of Mary, which I have done in the muscovite Cathedral of the Assumption, on March 24 that same year, according to what Our Lady had asked in Fatima. When I told to the Holy Father about these events, he was very touched and he said: "The Virgin Mary led you there under her protection". I responded: "No, Holy Father, she was carrying me in her arms!" After this, he asked me what I am thinking about Medjugorje and if I have visited that place. I answered that the official Vatican has not forbidden me to go, but that I was counselled not to do it. The Pope looked at me and said: "Go to Medjugorje incognito as you went to Moscow. Who can forbid you this?" The Pope has not given me an official authority to go there, but he found another solution. The pope continued to speak, and he showed me a book about Medjugorje written by René Laurentin. He started to read some chapters and he underlined that the messages of Medjugorje are in close relationship with those of Fatima. "Look, Medjugorje is a continuation, an extension of Fatima. Our Lady is appearing in communist countries primarily because of problems that originate in Russia", said the Pope, who already took this as a mission of his pontificate. This is why I immediately understood the connection. Did you have other occasions to speak with the Holy Father about Medjugorje? B.P.H. - Yes, the next time we spoke about Medjugorje was on August 1st, 1988. A groups of doctors from Milan, who were testing the children, came to visit the Pope in Castel Gandolfo. One of the doctors mentioned that the bishop of Mostar was giving them hard times. The Pope said: "As he is the bishop of that place, you have to respect him." Then he continued in a cordial tone: "But he will have to answer before God if he has not acted in a right way". After this, the Pope was pondering a few moments, and then he said: "Today's world has lost the sense of supernatural, in other words, the sense of God. But many people rediscover this feeling in Medjugorje through prayer, fasting and the sacraments." For me personally, this is the strongest explicit witness about Medjugorje. What has especially and profoundly impressed me is the fact that the doctors, who were present, declared "Non constat de supernaturalitate". The Pope, for his part, recognised long time before that the supernatural events are really at work in Medjugorje. Through many sources, the Pope came to the conviction that God can be experienced in this place. Is it possible that many things that happen in Medjugorje can be invented? B.P.H. - Some years ago, there was a Youth meeting in Marienfried, and I was invited. During the encounter, a journalist asked me: "Bishop, don't you believe that, all that is happening in Medjugorje, comes from the devil (Satan)? I answered: "I am a Jesuit. Saint Ignatius taught us how to discern spirits, but he also taught us that each event can have 3 different sources: human, divine or diabolic." At the end, he agreed with me that what is happening in Medjugorje cannot be explained from a human point of view - the fact that every year normal young people - thousands of them - are attracted, they stream in order to reconcile with God. Medjugorje has already been named "confessional of the world", because, as a phenomenon, neither Lourdes nor Fatima managed to spur that many crowds of people to go for confession. What is happening during confession? The priest is delivering the sinner from the devil. Then I answered to the journalist: "Off course, Satan is capable of many things, but he is not capable of one thing: Is it possible that Satan spurs people to go for confession in order to be delivered precisely from him?" The journalists laughed, understanding what I wanted to say. Therefore, the only cause remains in God. Later on, I told to the Holy Father about this conversation. How would you summarise the messages of Medjugorje? What is distinguishing these messages from those in Lourdes or Fatima? B.P.H. - In all three places, Our Lady is inviting us to repentance, forgiveness and prayer. In this aspect of the message, these three apparitions are similar. However, the difference in Medjugorje is that the apparitions are lasting for 23 years now. The intensity of the continuation of the supernatural is neither declining nor diminishing during all these years, and the result is an even greater number of intellectuals that are converted here. Some do not consider the events of Medjugorje as genuine because war broke out in this region, which has for result that nations turned one against another: isn't this a place of peace and not of conflict? B.P.H. - In 1991 (10 years after the first message: "Peace, peace and only peace"), when the war broke out in Croatia, I met the Pope once again, and he asked me: "How can the apparitions of Medjugorje be explained in the midst of the war in Bosnia?" Really, the war was terrible, so I answered: "It seems that we are in the same situation as in Fatima. If Russia had immediately been consecrated to the Immaculate Heart of Mary, the Second World War and the spreading of the Communism and atheism would have been avoided. Holy Father, as soon as, in 1984, you consecrated Russia to the Immaculate Heart of Mary, countless changes took place in Russia, and the fall of the communism began. In Medjugorje, Gospa started with the warning that there would be a war if we were not converted. Nobody took these messages seriously. Maybe, if the bishops of former Yugoslavia had accepted these messages more seriously, it would not have gone that far - but in any case, this would not have been a guaranty of the definitive recognition of the official Church, because the apparitions are still going on today." Then the Pope told me: "Then, bishop Hnilica is convinced that my action of consecration to the Immaculate Heart of Mary was valid?" I answered: "Certainly it was valid; the only question is how many bishops really did the same consecration in union with the Holy Father." Why is it so important that other bishops should have done the same in the sense of what Holy Father has done? B.P.H. - It is expressing the collegiality of the Church; in other words, the unity of the bishops with the Pope gives to it a far deeper meaning. When Carol Woytila was elected a Pope in 1978, I congratulated him, but I immediately told him that something would be missing to his pontificate if he does not consecrate Russia together with all the bishops. He told me then: "If you manage to convince bishops about this, I will do it tomorrow." This is why, after the consecration (25.03.1984), he asked me how many bishops concelebrated with me. As I could not answer him to this question, the Pope said: "Every bishop must prepare his diocese, every priest his community, every father his family, because Gospa said that also lay people must consecrate themselves to her Heart."